SECTOR: [PASS] Ctac is a IT / ERP service company started in 1992. SALES: [FAIL] The investor must select companies of "adequate size". This includes companies with annual sales greater than €260 million. Ctac's sales of €86 million, based on 2015 sales, fails this test. CURRENT RATIO: [FAIL] The current ratio must be greater than or equal to 2. Companies that meet this criterion are typically financially secure and defensive. Ctac's current ratio €22,4m/€25,1m of 0,9 is too low. LONG-TERM DEBT IN RELATION TO NET CURRENT ASSETS: [FAIL] For industrial companies, long-term debt must not exceed net current assets (current assets minus current liabilities). Companies that do not meet this criterion lack the financial stability that this methodology likes to see. The long-term debt for Ctac is €0,87 million, while the net current assets are - €3 million. Ctac fails this test, on the other hand debt is decreasing. LONG-TERM EPS GROWTH: [PASS] Companies must increase their EPS by at least 30% over a ten-year period and EPS must not have been negative for any year within the last 5 years. Companies with this type of growth tend to be financially secure and have proven themselves over time. 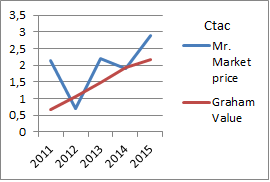 Ctac's earnings have increased 300% over the past five years. Earnings Yield: [PASS] The Earnings/Price (inverse P/E) %, based on the lesser of the current Earnings Yield or the Yield using average earnings over the last 3 fiscal years, must be "acceptable", which this methodology states is greater than 6,5%. Stocks with higher earnings yields are more defensive by nature. Ctac's E/P of 7% (using this years estimated Earnings) passes this test. Dividend: €0.06/€2,9 = 2% ? Dividend 2016? Conclusion: Ctac is a medium sized enterprise that is profitable, growing and returning money to shareholders. The price today seems reasonable. A buy at $2,50 .